My name is Erika. I am from Bogotá, Colombia but moved to Brandon with my mom and sisters some years ago. I am currently in my last year of a 4-Year Honours Bachelor of Science with a major in Chemistry and a minor in Psychology. I graduated from High School in 2014 and started university the same year. Prior to my arrival in Canada, I had little to no knowledge of the English language. In High School, I began to understand and write the language but spoke it infrequently as there was a Hispanic community at school. The first time I encountered the language barrier was when I started university since I was the only Spanish speaker in most of my classes. My first year was a bit tough and quite frankly, I even doubted the possibilities of pursuing an education in English since I could barely speak the language. I decided to motivate myself in terms of enhancing my English-speaking skills even though I did not like speaking the language. Up to this day, I still feel conscious of my accent and cannot help but worry that I may not be understood when I speak. But overall, my drive and abilities have demonstrated to me, through time, that even though English is not my first language, I can accomplish big things in academia and otherwise. A strong and independent woman, who would not let me give up so easily, raised me. My mom is my biggest inspiration and plays a huge role in why I keep moving and pursuing the things I want in life. I also want to be a good role model to my sisters and be able to demonstrate that, irrespective of how difficult things may seem, anything is possible if they work hard and believe in themselves and their abilities. In the near future, I will be pursuing a master’s degree. But my passion has always been to help people and I want to do it through the medical science platform. My life goal is to become a physician, to help my Hispanic community and the general public at large. I am very grateful for the opportunities and experiences I have had at Brandon University and would like to thank those who nominated me as an exceptional female student. I would like to nominate Erika Acero for the International Women’s Day celebration. 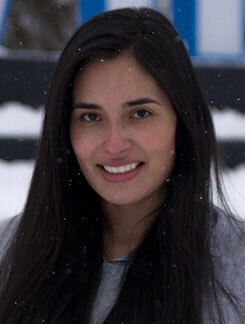 Erika, originally from Columbia, has done amazingly well within her degree program at BU (4-year Chemistry Honours). She has won numerous awards (Zonta Club Scholarship, Dean’s Honour list) and tackled some challenging problems in her Honours Research project. As part of her research she has synthesized some compounds that have never been made before. Just think of that, in the entirety of human history, Erika has made compounds that are new and hers. She works very hard, inside and outside of school, is focused, driven, and will no doubt be successful in the future because she is successful now. Most importantly Erika is friendly, kind, and makes the world a better place to live in.